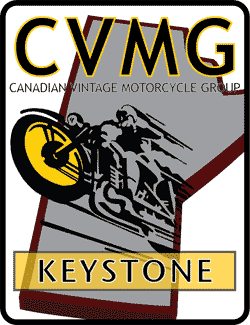 The Keystone CVMG is the Manitoba section of the Canadian Vintage Motorcycle Group. Our home base is Winnipeg, but our diverse membership stretches to all four corners of our great province. During the winter months, Keystone section meetings are held at the Royal Canadian Legion Charleswood Branch #100 on the third Wednesday of each month. Come spring and summer, we visit with members able to hold meetings at their homes – or garages – and ride to a variety of locations and events with other vintage motorcycle enthusiasts and CVMG members. Like our logo shows, we like to explore Manitoba's boundaries, check out all parts in between… and beyond. Our current section president is Terry Neustater.